I was contacted by a nice man from England who is Greek by heritage who wanted me to test out his skincare and body care line. I said I would be more than happy to try it out. If there is one thing I love to do, it is help out someone from Greece who is trying to put out a product line. This line is all natural and as far as I know it is organic too. They have skincare, garden products and even pet care products. I received an assortment of products to try out and below are my reviews. This spray contains rosewater, water, dittany herb, and essential oils. It was made and bottled in Heraklion, Crete. The spray is great for waking up the skin, as a toner, as an after cleansing spray to bring the pH level back to normal, to revitalize the skin. Rosewater helps soften the skin, hydrates and aids in bringing the pH level back to normal. Dittany (an herb found only in the mountains of Crete) hydrates and revitalizes the skin. The essential oils in this tonic are there to help the skin and keep it from being too oily or too dry. This is to normalize the skin. It can also help the skin after its been in the sun for too long, it helps aid sunburns, place it in the refrigerator and spray the burn, alleviating the pain and helping to heal the burn. This anti-wrinkle face cream is made with virgin olive oil. It has regenerative and moisturizing properties. The cream smooths wrinkles, helps with elasticity, firms skin and renews the epidermal skin cells. It is primarily for mature or dehydrated skin. However, it can also be used as a mask for intensive nutrition overnight. How to use: Apply Timeless Antiaging Moisturizer on face and then gently and evenly spread moisturizer on face and neck in upward and outward movements. It should sink in almost immediately. What I love about this moisturizer is that when used overnight as a mask, it leaves skin so much softer and feeling more plump. I like the heaviness of this moisturizer, yes it is for more mature skins so I leave it for overnight use as a mask, but it is a great moisturizer. Light and classic, olive oil bar soap creates a rich, subtly scented lather. Handmade, using a traditional cold process method, each bar is hand cut, stamped and wrapped with care. With olive oil for supple skin, restorative coconut oil and dittany herb with water distilled from the mountains of Crete, it creates a rich lather that cleans and moisturizes. They use absolutely no artificial colorants to make their soaps. The color differences you see in the soaps, are due to the ingredients themselves. They also use no artificial latherers – the recipes contain their special proportion of natural oils that allow their products to lather wonderfully without the need of chemicals. The ingredients are as follows: Olive Oil, which is rich in antioxidants, and vitamin E, rich in polyphenols and also minerals, and is extremely beneficial for the skin. It also contains extra virgin olive oil, coconut oil, castor oil, chamomile and essential oils. Coconut oil has anti-aging and antioxidant action. Castor oil has anti-inflammatory, anti-bacterial, anti-oxidant, anti-viral and anti-fungal properties. Chamomile is beneficial for rashes and scarring, in addition to its moisturizing and acne cleansing abilities. This can be used on the face or the body. Body soap: for dry skin with probiotic constructive microorganisms. How to use: Start by producing enough foam to apply to your skin. Do this by splashing water on your hands and face. Then take the soap between your hands and rub for about 15 seconds until you have some foam on your hands. Set the bar of soap down and continue to rub your hands together until a nice, creamy foam has been produced. Assists in moisturizing lips with amazing hydrating effects, keeping lips plump and gorgeous. 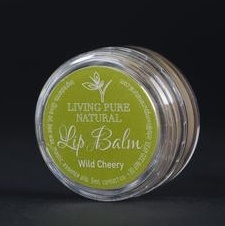 Lip balm provides intensive protection for sensitive lips thanks to the valuable properties of honey and mastic. Simply apply to the lips as necessary and leave to soak in. Also suitable as a base for lipstick. Ingredients: Pure Olive Oil, Beeswax, Essential Oils, Mastic (from the Mastic tree similar to gum), EM-effective microorganisms. 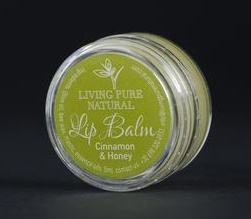 I really like the Cinnamon & Honey lip balm, it's so different than any other lip balm I have ever used before. The scent and taste is just like being back in Greece. Ingredients: Pure Olive Oil, Beeswax, Essential Oils, Mastic, EM-effective microorganisms. There you go. These are the things I experienced from Living Pure Natural. I really love the items I tried out. I love the spray, moisturizer, soap and lip balm. Oh yeah, that is everything! These are batch made products made in Crete that are made by a small company trying to make nice products that are natural and organic all so they can do some good. Living Pure Natural wants you to live like they do in Greece: naturally and by the earth. Everything in Greece is done this way. Having been there several times I can tell you that Greece is a wonderful country and they make the best products around. I love homemade Greek products. Like Living Pure Natural on Facebook: https://www.facebook.com/livingpurenatural/shop/ and Follow Living Pure Natural on Twitter:@livingpurenat. To shop for Living Pure Natural, shop www.livingpurenatural.com.